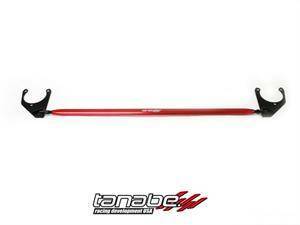 Tanabe Sustec Front Strut Bar for the 11-16 Scion tC (tC2) TTB160F. The strut tower bar is arguable one of the least expensive upgrades that can provide a very high degree of benefit that is felt immediately after installing on your Scion tC. Whenever driving aggressively, a vehicle's suspension can only work just a hard as the stiffness of the chassis permits. Increase the rigidity of the vehicle's frame resulting in improved, predictable handling. A reinforced lip is used to reduce bending of the bar. A specially designed bar with a hollow center and reinforced side walls for increased rigidity and reduced weight, extremely flex resistant. A polished finish for added good looks.